A warm and stretchy zippered baby suit perfect for the chilly winter months! The jacket version can be closed with toggles. Chest: 24 (26, 28, 30)"
Suit Length: shoulder to bottom leg - 21(23, 25, 28)"
Jacket Length: 10 (11, 12, 13)"
You can also view all Knitting Pure and Simple Baby & Children Patterns. 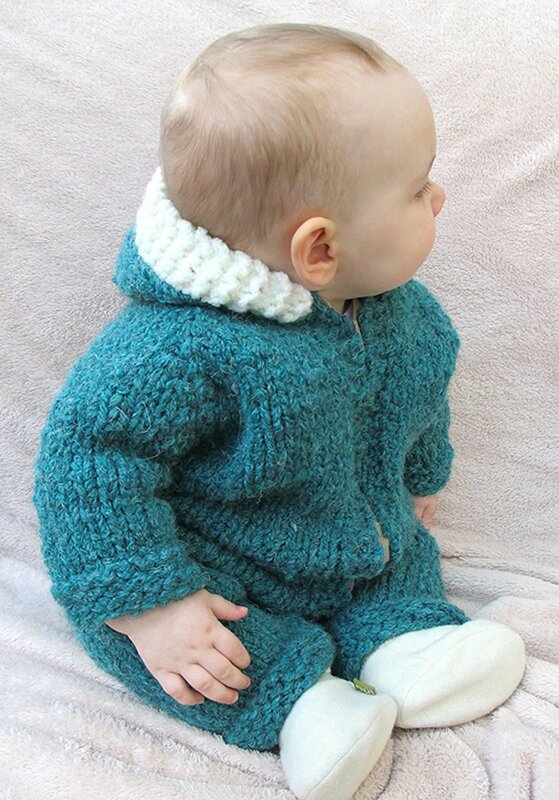 This Knitting Pure and Simple Baby & Children Patterns requires a super bulky (11 sts or less/4 in) yarn. We offer many types of yarn in the super bulky (11 sts or less/4 in) weight. Some options are listed below, but you can always go to the advanced yarn search page to see all available options. Of course, due to differences in individual knitting styles, you should always measure your gauge prior to beginning any project. If you do not see a yarn you like, choose from one of the options below to find other ideas. 2. Go to the advanced yarn search to find compatible yarn. Spud & Chloe Outer Yarn From $11.28 to $18.80Select colors on sale now! Knit Collage Pixie Dust Yarn From $29.60 to $37.00Select colors on sale now! Rowan Big Wool Yarn From $10.18 to $16.95Select colors on sale now! Knit Collage Wanderlust Yarn From $30.80 to $44.00Select colors on sale now! Knit Collage Spun Cloud Yarn From $25.90 to $37.00Select colors on sale now! Knitting Fever Big Freakin Wool Yarn From $12.00 to $20.00Select colors on sale now!